I've got the Kindle fully charged and "Ammie, Come Home" at the top of the queue, so I'm all set for the start of our Sept. 1st buddy read kicking off the much anticipated Halloween Bingo 2016. Yay! "Ammie, Come Home" is arguably one of Barbara Michaels' most frequently recommended books. People have tried to get me to read it for over 15 years, but I've resisted. Why you ask? Because I'm a big scaredy-cat! Maybe all the anticipatory dread was for nothing. 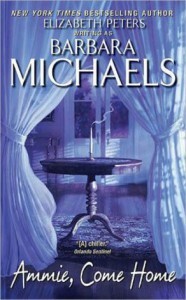 I've read maybe half-a-dozen other Michaels titles and lived to tell the tale, after all. :o) So let the reading begin!